The name Bruins Den comes from the Old English word for bear -- bruin. Find your inner bear at Bruins Den. This Bryson City vacation rental has everything you need to refresh your spirit. Bruins Den is the epitome of comfort with a sprawling layout, easy access, and all the comforts of home plus more. This well-appointed mountain getaway features 3 bedrooms plus a loft and 3.5 baths. There’s plenty of room and plenty to do -- a beautiful mountain view sprawls through the trees before you and the large yard around Bruins Den. Roasted Marshmallows and stories await you at the fire pit under the brilliant stars. Start your day off right -- huge windows let in mountain sunshine. Stainless steel appliances and gleaming granite counters brighten the fully equipped kitchen. The first bedroom is a real treat with a King bed, flat screen TV, and private bath with a large jetted bath tub. The second and third bedrooms each have a queen bed and TVs. The alcove in the loft has two twins, which for an additional charge can be converted into another King. To accommodate two additional guests, there’s a queen sleeper sofa in the loft. Ceiling fans on the porch catch fresh mountain air. Let your cares drift away on the large covered porch with rocking chairs and a porch swing. A griller’s delight, Bruins Den has a gas grill and picnic table that are just right for savoring meals. Your team was very supportive and provided all the information we needed. The view from this cabin is amazing! You could clearly see the fog roll in on top of the mountain and flow away again to reveal the majestic mountains! Property had everything you would need for a great stay with a large group. We had a wonderful time in your beautiful cabin. Great for families with kids! Very cozy, clean and spacious. Hope to be back soon! We are so happy to be back at your beautiful cabin! We came here 4 years ago and have been looking forward to coming back. The weather has been beautiful - chilly and crisp mountain air. Spending time with family makes this place very special to us. The cab had everything we had wanted and more. 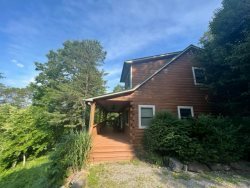 It was so easy to find what we wanted on the website, the cabin is a beautiful property and excellent view.It was great. The staff is friendly, professional, caring. Everyone we spoke to, whether through email or on the phone, was friendly and helpful. The cabin was clean and exactly as pictured. All the amenities that were described in the listing were available to us. The cabin and the features were perfect for our group size. My favorite feature would be the deck. It was the perfect place to just hang out outside together. We had a wonderful time. Your cabin was so comfortable and spacious for the 8 of us. We had a great stay with our group of 9 people. The house is very comfortable, super clean and all the amenities you need to be both indoors our outdoors depending on the weather. Well located to go to the Smokys Park, do some rafting or hiking and get your groceries nearby. We loved the location, the view and the hot tub! We went hiking kayaking rafting zip lining and enjoyed our vacation. Loved your beautiful home. You can definitely feel the love. Many blessings and love to you and your family. We had a terrific time. The cabin was perfect. Can't wait till next year! Everything was wonderful. Loved the crockery and the coffee mugs. The cabin was very clean. Charming home, incredible landscape, wonderful weather - a perfect getaway for the extended family. The cabin is beautiful! We came for the Polar Express. It was a beautiful snowfall so we played it the snow and roasted marshmallows!! Fabulous weekend! The cabin was perfect for our family! It was the best place ever for a 6 year old birthday! We loved the deck and the firepit. The view is great. Beautiful cabin and view. So homey yet plenty of space. Bryson City was great. The cabin was very nice and comfortable. We loved the view. Whenever I sent an e-mail I got a response very quickly. They were very helpful! Thanks for the use of the Cabin and it was more than enough space and set up well for our party of 8 people. We thoroughly enjoyed our stay here. Your home is lovely and beautifully maintained. The view is special and the leaves were gorgeous. Great fire pit!